Kerry Washington's looking forward to more steamy and salacious plot twists in "Scandal's" second season. Kerry Washington can’t wait to scandalize you all over again. The star of ABC’s mid-season hit “Scandal” admits she was thrilled that audiences discovered Shonda Rhimes’ jaw-dropping peek inside the treacherous world of high-stakes crisis management and backdoor Washington politics. With viewers now able to pour over every twist and turn a second time as the addictive series makes its home video debut on June 12, Washington – who’s currently filming Quentin Tarantino’s “Django Unchained” – tells PopcornBiz she’s gearing up for an even more shocking second season and reveals her own real-life (and non-scandalous) connection to the President of the United States. How much of the ongoing and upcoming juicy secrets are you privy to as an actress, or does Shonda keep that info to herself and you only find out every time you get a new script? When the fans of the show have been freaking out week to week, I totally relate because that is how we felt each week, getting a script. When you work for Shonda you don't get an outline of the season. You learn it as you learn it. Sometimes even when you ask questions about your character she's like, 'I don't know yet.' Sometimes she's really clear and sometimes not. So it's been amazing, really fascinating and fun. Yeah, each week was shocking. You had seven episodes this season, and next season will be a fuller one. Do you chat about how to sustain all the bombshells over the course of a longer season? Jamie Foxx stars in Quentin Tarantino's "Django Unchained," as an ex-slave who helps a bounty hunter (Christoph Waltz) in return for help exacting revenge on his former owner (Leonardo DiCaprio) and rescuing his wife. Opens Dec. 25. We've been picked up for 13, which is the maximum that a mid-season can get picked up for, so hopefully if people continue to tune in in good numbers we might get more. I'm not really privy to those conversations – that all goes on in the writer's room, but I do know that they're really excited. The writers are already back at work in preproduction and they're super excited, and Shonda is feeling really good about some of the scandalous twists and turns that lay ahead. I just trust them and I'm excited. 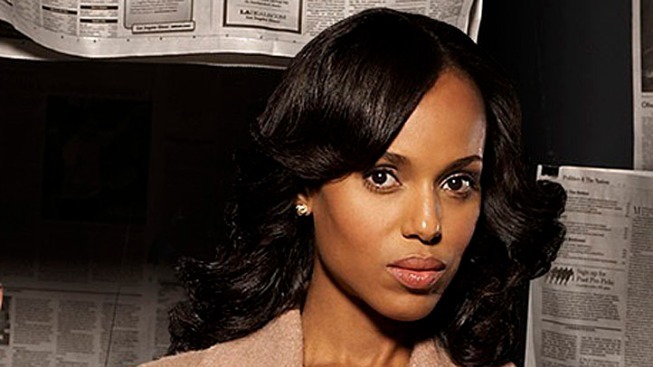 What do you love about being Olivia Pope, and about the world she operates in? I think what I love most about Olivia is kind of what challenges me the most about her, that she's got all these contradictions. From the very first episode you hear characters say how amazing she is and how strong she is and how she's a gladiator and she doesn't believe in crying. And yet by the end of the episode she's crying alone in a coat closet, so it’s that kind of duality, the idea that she's able to be one person in the public eye and a different person privately and there's a small group in that private circle, that sometimes the president is privy to that private Olivia. There are a very few people who fit into that, in those moments, but I think that's the thing that I like most about playing her, the challenge of those complexities. The thing that I love most about the world of crisis management is really what you hear from Judy Smith, who the show is inspired by: that crisis comes in all different forms and all kinds of people require damage control. So you never know who's going to walk in the door of Pope and Associates. You don't know if it's maybe someone in politics or someone in labor, someone in big business, someone in entertainment, in sports. I think that's one of the things that makes the show so exciting, that even the show is set in the world of Washington and obviously Olivia has a very complicated relationship with the White House and a complicated history with the White House, the circumstances of the work that we're doing as a firm change in unexpected ways week to week. In talking to the people who live in this real life world, have you heard stories from them that are beyond what we're seeing on the show? Absolutely. I've heard stories from Judy. The thing is she never attaches names, so I don't know who she's talking about. But you hear from her, from people, clients that she won't work with, clients she has worked with. But also I feel like while we were shooting Season One, things would pop up in the news and we'd say, 'If we wrote this no one would've believed us. People would say that this outrageous!' And we read about things that happen, whether it's in politics or entertainment, week to week that are I think are as outrageous, if not more so, than what goes on, on the show. What's the question that keeps coming out of fans’ mouths when you encounter them, and what do you tell them? Since the season finale the one question that consistently comes out of people's mouths is: ‘Who is Quinn?’ And I think to a certain extent I'm really happy that Shonda hasn't told us, because by now I think I would've folded! I'm no Olivia Pope and I get so much pressure everyday from friends and family members. People are dying to know. You go from working with a television auteur like Shonda to working with a film auteur like Quentin Tarantino on “Django Unchained.’” How quickly did you jump from one role to the other and how is that going for you right now? I don't remember! It all feels, to be honest, like a little bit of a blur, but I don't think there was a whole lot of time that transpired between the two projects. What's the experience been like working on a Tarantino film for you? It's tricky to talk about because we're still in it. I'm not outside of it yet, but it's been really profound, a very profound experience. I can imagine you're trying to soak up every second of the experience as it happens. Kind of, but also the material is so challenging. It's been difficult at times, too. Is that a part of the reason you signed on – you like a challenge? For sure. I think that it's important to challenge yourself, and for me, particularly in my work, I think doing work that challenges me is important. It keeps me on my toes. It keeps me refining my craft. People are now hanging on every episode of 'Scandal.' Have you ever been addicted to a show like that, something you couldn't get enough of? I'm a big 'Game of Thrones' fan, for sure. My parents were addicted to it first, and they were watching it on Sunday evenings, so I sort of watched it to make fun of them and tell them how stupid it was and poke holes in their theory that it was a great show – and of course the opposite happened and I got completely sucked in! I think that was around episode three of season one. I just went back and watched the first episode On-Demand and I watched all three that night. And what are you into away from work, something that you've been passionate about lately? I've always done a lot of work in arts advocacy and arts education, working with groups like Americans for the Arts. I actually was appointed to the President's Committee on the Arts and Humanities in 2009, so I've been working in the administration for several years now. The committee is an advisory committee to the White House and we work in partnership with National Endowment for the Arts, National Endowment for the Humanities, Institute of Museum and Library Services among other agencies. So that work is very important to me. We have really exciting initiatives and currently we're launching a project called Turnaround Arts, which is where the committee is partnering with some of the nations most challenged schools to help improve those schools using integrative arts education. We also have a program called Film Forward, which is cultural diplomacy through film where we send films and filmmakers that are normally art house films overseas to different embassies and communities with the filmmakers to encourage cross-cultural dialog. So we do a lot of work that I'm really proud of on the Committee. I take it you've spent time with President Obama on occasion? I have. I was a surrogate in 2008 and I'm currently a surrogate again, working for the campaign. Having met him up close and personal, what's the thing that stays with you the most about the President as a person? I really admire them as a couple, the First Couple. I just think they're both so strong. They're both just such smart and strong and sophisticated and passionate people who have really dedicated their lives and sacrificed a great deal in service to this country. They're so loving and respectful of each other and they really prioritize their family and their work. I just really admire them as a couple.